A hungry man has been lucky enough to partake in quite a few special events over the years. 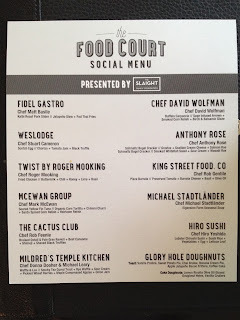 But, when an invitation to attend the second annual Food Court Social - 2015, presented by the Slaight Family Foundation and featuring some of the best chefs in the business teaming up to support the Augmented Education Program at George Brown College, I jumped at the chance to attend. Upset stomach and possible flu be damned. This was an event designed to not only showcase our incredible, local food talent, but also to highlight and, lets be honest, solicit much needed funds, for a program that was created to train, find and maintain employment for individuals who have struggled with mental illness and addiction. What can be said about a night where people spend money to give money, other than boy, do they know how to party. It was truly a spectacular night. The evening was warm and breezy, and the air just wafted with the scent of expensive cologne, perfumes and tasty fried chicken (thank you for that, Chef Mooking). Who knew that all of those scents would combine to smell pretty great, not to mention a chance to get the scented masses in attendance to possibly top the previous years fundraising amount of $150.000. And the event setting? 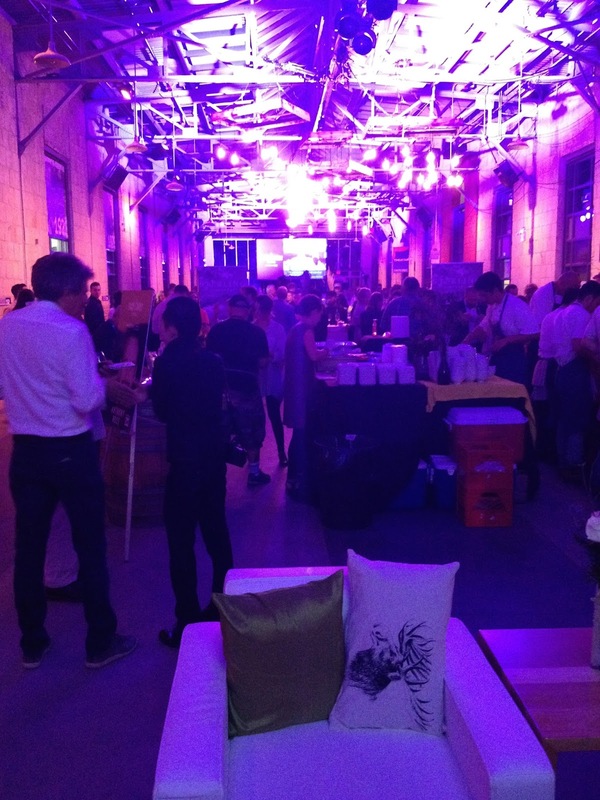 It must be said that Wychwood Barns Community Gallery was the perfect space for this type of event. It's a gorgeous, reclaimed art space in north Toronto, and you just knew that great detail went into making the place look so casually elegant, with special stations set up for each Chef and their team. All these details, along with an incredible roster of chefs donating their time for this very special cause, only highlighted the importance of the Augmented Education Program. The Augmented Education Program is an innovative partnership between George Brown College and the Centre for Addiction and Mental Health. The program is free for prospective students, and is designed to help people with mental illness or addiction histories prepare for, find, and maintain employment in two particular programs: the Assistance Cook, and the Construction Craft Worker. This skills-based training is coupled with job-related certifications, access to coaching and clinicians, soft skills training like conflict resolution and time management and other supports that contribute to student success. Since it's launch, the graduate job retention rate (6 months) was 81 per cent for the Assistant Cook program, and 83 per cent for the Construction Craft Worker program. The success of the program is clear- and absolutely needed in order to continue operations, and these are the reasons why so many of our top chefs have agreed to take part in the Food Court Social fundraiser. One of the participating chefs, Mark McEwan, told me that he believes in and wholeheartedly supports the Augmented Program because "the benefits to the people who are in it is invaluable." I couldn't agree more. And since it is a program by my culinary alma mater George Brown, I was particularly proud to be a part of this special event. This event only re-affirms my love for the culinary world. It isn't always about finding out whether molecular foam really does enhance a dish, or if that seaweed is better accoutrement to a salad then, say, dandelion leafs. It is not just the fact that you are the observant recorder of food ideas, recipes and trends. It is also about checking to see, and asking, about what issues matters to the people who call on the culinary world for their lively hood. It's also about discussing and revealing how they contribute to solving these issues that not only affect their businesses, but how it personally impacts them. It's about setting business needs aside to address something that is distinctly and profoundly human. A worthy cause that needs all the attention - and funds, it can get. You may have missed the event, but it is never too late to donate. For more information, and how to donate to the program, please visit: the food court social. Prices are reasonable, food is delicious, and wait staff is sweet, conscientious, and adorable. I came here for an event, got contained to upstairs. Service at best halloween party nyc was prompt and food was awesome.